Tuberculosis is an infectious disease caused by Mycobacterium tuberculosis. It is an ancient disease, with evidence found as far back as 3000 BC in the spines of Egyptian mummies. However, it was in the 19th and 20th centuries that TB first became a major public health issue (known then as the consumption) causing widespread illness and death. Transmission was helped along significantly by poverty, overcrowding and lack of sanitation, problems still faced in many parts of the world today. Roughly one-third of the world’s population has been infected with M. tuberculosis, and new infections occur at a rate of one per second on a global scale. Once a person has been infected, TB can sit latent inside the body without causing active disease. Many people clear the bacteria and never develop symptoms of TB, but this requires an intact immune system. When you throw HIV into the picture, TB has a new aggression, and my time here in Zambia has proven to me that I should believe the WHO statistic that TB is responsible for one quarter of all deaths in HIV. TB most commonly affects the lungs, but can affect almost anywhere in the body. Since moving to Zambia, I have seen abdominal TB, TB adenitis (TB of the lymph nodes), TB spine, TB meningitis, TB of the spleen, and TB of the adrenal glands. I have seen a teenager crippled so badly by TB that he is permanently bent double and can barely walk. 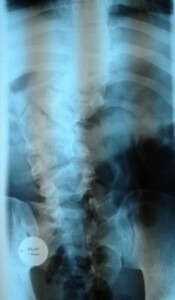 His X-ray (below) shows how much destruction TB can cause to a spinal column that should be as straight as an arrow. I see patients coughing up blood and struggling to breathe, and neck lymph nodes so big and matted that the patient could barely turn their head. I have also seen far too much death at the hands of TB, and I know it is a disease to take very seriously. TB is spread from one person to another when a person with active TB of the lungs coughs, sneezes or talks sending infected droplets out into the environment. The people at risk are those who are in enclosed spaces with someone who has active lung TB and is coming into frequent contact with these infected droplets… therefore, family members, household contacts… and healthcare workers. Wow, that’s scary, to think of TB being so transmissible and you being to close to it day by day. It’s a brave thing you’re doing, caring for patients there in Zambia. Here, we’re hoping to avoid contracting influenza as well as the new, mutated strain of norovirus that’s on the move now. No matter where we are on Planet Earth, there’s always something out to get us. All we can do is try to be as healthy as possible, and carry on. Here’s wishing all of us the best of luck in staying well! I agree with everything SuzyR says above. The things we take for granted in our little world. As you say, lets just hope your immune system is top notch, the job you are doing is amazing enough in its own right, let alone being subject to all the local ailments. Speaking to Mum on Tuesday 29th Jan, and she tells me she is popping over for a few days and bring certain clothes, because some of yours are going mouldy, because you cannot dry them in the rainey season. All these trials and tribulations that have nothing to do with the job. We have had quite a wet period in the UK since november, but we can just pop the wet washing in the tumble drier, just another little thing we take for granted. Stay healthy and with a smile always on your face, nothing can go wrong.